The interior of the one bedroom apartment in the Manhattan building on Albert St that sold for $403,000. There was not a lot on offer at the main Auckland apartment auctions this week but what was on offer generally sold well and there was an overall 80% sales clearance rate, better than it has been for a long time. The week kicked off up at City Sales' auction room on Karangahape Road, where a one bedroom shoebox (26 square metre) in the C-Vu building on Day Street was offered. This building has had extensive remediation works carried out and is now waiting for a new Code Compliance Certificate. There were multiple bidders competing for the unit and it sold under the hammer for $268,000, although auctioneer Kim Spark and his team had to work hard to get it to that level. At Barfoot & Thompson's main apartment auction two units were on offer. The first was a large character apartment in the Farmers Heritage building. Unusually, it was a one bedroom unit with an impressive 96 square metres of floor space and came with a car park. It was disclosed at the start of the auction that the vendor was an employee of Barfoot & Thompson, but there were no bids for the unit and it was passed in. 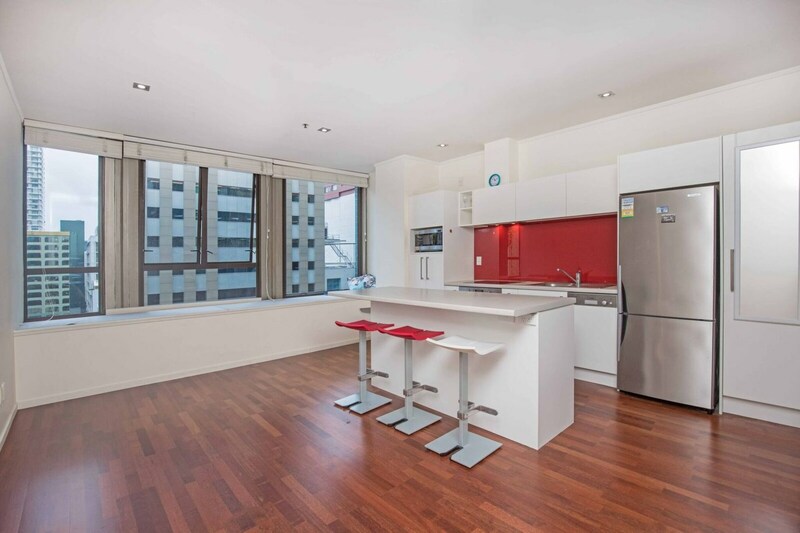 The second unit was offer was a 53 square metre, one bedroom unit in the Fiore 2 complex on Hobson Street. There was only one bidder for the unit but it was sold under the hammer for $480,000. At Ray White City Apartments two apartments were offered, the first a 49 square metre, one bedroom unit in the Manhattan building (pictured) which had four bidders competing for it and sold under the hammer for $403,000, and the second was a two bedroom/two bathroom unit (95 square metres) with a car park in the Hudson Brown building near Vector arena. Units in the Hudson Brown building are on leasehold titles and the unit that was auctioned had body corporate fees of $10,285 a year. There was only one bidder for it but it still sold under the hammer for $331,000. At the same auction a house in Mt Roskill with weathertightness issues was also offered and received several bids but was passed in for sale by negotiation after receiving a top bid of $220,000. Check out the results of residential auctions from around the country on our Residential Auction Results page. Getting in before Brightline 5 then? The 5 year Brightline will not be retrospective so your comment is incorrect! Because it won't be retrospective it would pay to get in now wouldn't it? Thought the comment was aimed at vendors selling before the Brightline 5 years was brought in! Wouldn’t be buying in Auckland at the moment because of the Brightline, you should be buying because you are seeing value and would be wanting to hold for at least 5 years anyway. Spec buyers will get burnt unless they know what they are doing Zach. TM2 – I’ve been thinking about your concerns regarding the “COL”. Wondering if the National Party would actually overturn any 5 year Brightline or offset losses changes if given the future opportunity. I see some statements and posturing of course from the opposition – however, maybe they’ll just wait and see what eventuates. IRD - wheezing and puffing to keep up. As a National Party member I’d say none of that will be overturned. That is what gets my gander up with the COL. They spend like a drunk sailor on pay day and the sober ones amongst us are stuck with paying for their profligate ways for decades to come as each party lifts its financial skirt higher. We need a good recession to reset this mess. What are the “COL” spending on that grinds your gears? Kiwibuild for example has $2 billion set aside, which is about half the amount paid by the 4 Aussie banks to their parent companies in dividends in the past year. Why are you not outraged by the Aussie banks creaming it out of us? At least a good chunk of Kiwibuild money will stay in New Zealand, and most of that $2 billion will be replenished as Kiwibuild properties are bought. I assume you realise that the COL has projections that have $4,000,000,000 in extra tax revenue every year to meet their spending plans? That means by 2020 an extra $12,000,000,000 will come out of our pockets or an extra $2,600 for every many woman and child in NZ. A prudent household e.g. mine, spends only income it knows it has and it doesn’t commit to spending for ever at current income levels or anticipate ever increasing income. That’s why I will continue to call the PM Taxinda. It may not have come yet, but like a 20 year old with their first credit card, you know the day of reckoning is on its way. Would you rather the government borrowed the money? I would rather that they spend with the recognition that every dollar that they take off a tax payer is a dollar that tax payer can’t use for their own needs I.e. not spend it in the first place on low quality items. The student bribes are a good example. As someone said previously, this government has yet to find a tax it doesn’t like. Nothing bright about bright lines when the market sentiment has already turned from rampant speculation to timid thoughtfulness. Gone are the grey money foreigners big numbers. Local investors are predominantly longer term than 5 years anyway. My thinking is that this may well be here to stay - no matter who’s got hold of the steering wheel. Its impact on those buying conservatively and for the long or long, long term (retirement) will probably be minimal. This is hardly revolutionary - there’s just a couple more things to keep in mind now – that’s all. I would also think that, barring something dramatic – residential property will still remain the “go to” investment for many. That depends on the context. Tax relief is part of what is called "nudging theory". You should do yourself a favor and read about it. So if someone makes a decision to sell investments based on changes to taxation, the comment can describe behavioral change. It is neither correct or incorrect. Just so you know its 'Nudge' and not 'Nudging' and I'm pretty sure Tax reform at this scale falls outside the concept of "a nudge". You might want to double check what your reading. "A nudge, as we will use the term, is any aspect of the choice architecture that alters people's behavior in a predictable way without forbidding any options or significantly changing their economic incentives." Wow 80% the numbers don’t lie the market has bounced back for sure. True resilience after a period of oscillations. Only upwards from here. Auction outcome statistics mean very little these days. Those who dwell on them would do better finding themselves more fruitful endeavours. TTP, if in the first five times you fail getting your message across, why try the exact same message another three times? Isn't your failure now statistically significant for you to dwell upon? I doubt my message is wasted. The reality is that in a slower property market (such as the present one) auctions become less relevant. Many (most?) vendors have cottoned onto this - but others learn more slowly....... Thus, the occasional reminder can serve a purpose. Statistics aren't required........ commonsense is enough. That may well be true. But what's great is that the market is not as rampant as before. Less people out bidding each other creating fear and panic of missing out. Now deliberate consideration and whether property is worth the asking price. At the end of the day it is up to the buyers as to how much they are prepared to pay for any property! If there are very few buyers then the market will flatline at best and probably drop until the vendors start accepting the offers. Yes we all know that it has increased mainly thru overseas money rather than the average kiwiborn buyer. There has been no reason for Kiwiborn buyers to keep the prices rising. Posters on This site should stop blaming property investors for forcing prices up as it is not in their best interests to do this, as true investors want to,buy as low as possible. Unfortunately there will be a lot of investors who will need to sell and may well get burnt. The returns in Auckland currently are rather pathetic with negative returns and ringfencing being brought in there are going to be some sleepless nights for some. The government can’t continue to hammer landlords as they are not capable of providing accommodation for people who haven’t bought. Personally want them to provide accommodation as there are so many that private landlords like ourselves, aren’t prepared to take on!